The continued misadventures of Kimelle’s Optimum Jive aka OJ the standard poodle. As I was saying in the last entry, skillful counter surfing requires stealth, balance and ingenuity. OJ’s ability to balance objects is particularly impressive, especially when one considers that he has to do it without opposable thumbs. He’s not even a particularly huge standard, either, reaching only 25 inches at the withers, so he can’t use height to much advantage. Yet, it is not uncommon that I should wander down the hallway and discover a now clean frying pan nestled artistically in the centre of a dog pillow. I’ve never caught him at it, so I’m not sure how exactly he manages to remove the pan from the stove and get it into the living room without dropping it on the floor. Talented dog, indeed. The best example of OJ’s remarkable balancing skill came on a day that I’d made myself tomato soup and a grilled cheese sandwich for lunch. I made up the can of soup (artfully seasoned with garlic, oregano, basil, and parmesan) ate my lunch and then wandered off to do some chore. I left half the soup in the pot on the stove for a second helping later. Did I mention my living room couch is white? I went into the kitchen for another bowl of soup. I went to the stove and looked around blankly. The pot was missing. I was the only human at home. I went hunting. I came around the corner saw something suspicious twinkling in light. I stepped closer in amazement. You’re imagining my couch looked like a scene of carnage from a horror movie, aren’t you? You’re imagining it appeared as if a murder had been committed at the stove and the hapless victim was dragged, thrashing in agony, splattering red all the way to the couch where he’d been finished off in some gruesome throat ripping way, right? Yeah. So was I. Well, we were both wrong. All that greeted me in the living room was a spotlessly clean sou p pot glistening in the middle of my still pristine white fabric couch. There was not a drop of tomato soup to be seen anywhere. Not in the kitchen. Not in the hall. Not in the living room. How on earth did he manage it? Your guess is as good as mine. Like I keep telling you. He’s a talented boy. Really, I just need to figure out how to train this dog to return the scrubbed pots and pans into the sink. PS. OJ wishes you to know that he posed today for the accompanying photo under duress, simply for illustrative purposes. 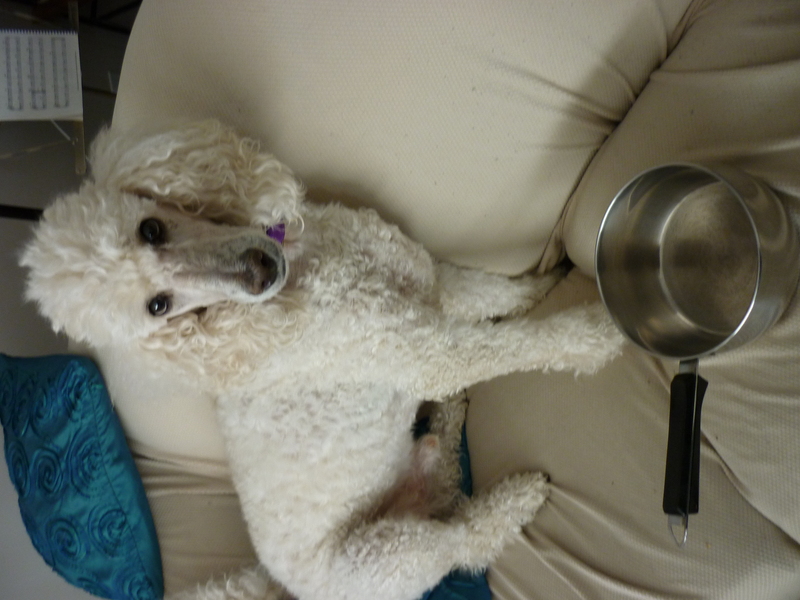 He asserts that he has absolutely no knowledge of any empty tomato soup pots alledgedly found on the living room couch . OJ likes tomato soup, but his favourite is butternut squash, as you’ll see here. Thanks for a hilarious story about your poodle OJ.